For the second straight night, the University of the Fraser Valley men’s soccer team mustered a dramatic goal in second-half injury time to secure a crucial result against the UNBC Timberwolves. On Friday, Andrew Peat’s added-time header sent the host Cascades to a 1-0 win over the T-Wolves while simultaneously clinching a playoff berth. On Saturday, it was a Gurmaan Jhaj penalty kick in the dying minutes that sealed a 2-2 draw at MRC Sports Complex, locking up the No. 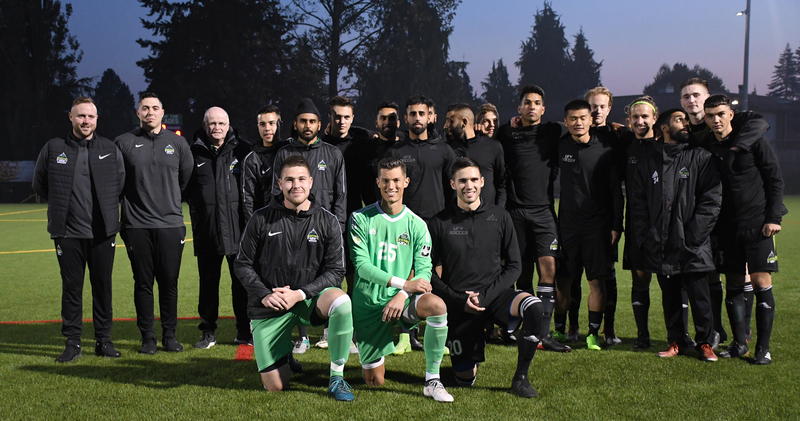 3 seed in the Pacific Division for UFV (7-6-2). A win for the T-Wolves (5-4-6) would have punched their playoff ticket while leapfrogging UFV for third place in the Pacific; as it stands, UNBC now has to sweat Sunday’s game between the Thompson Rivers WolfPack and UBC Thunderbirds. TRU (5-6-3) can draw level with UNBC for the fourth and final Pacific playoff berth with a win over the undefeated T-Birds (13-0-2), and they own the head-to-head tiebreaker. The Cascades mounted a furious push over the final half-hour of play, but UNBC keeper Rob Goodey kept them at bay. In the 66th, UFV’s Jun Won Choi was tripped up in the box, and Jhaj stepped to the penalty spot. But Goodey dove to his left and got his hands on Jhaj’s low drive – a stunning stop. ⚽️ MSOC | 90’ | Cascades GOOOOOAAAAAL! T-Wolves whistled for a hand ball in the box, @Gurmaan_Jhaj steps up and converts the PK! Final whistle sounds 2min later, and the Cascades secure 3rd place in the Pacific Division! “That’s what leaders do,” Lowndes said of Jhaj, who extended his team record with his 13th goal of the season. “They take responsibility, and when something bad happens, they don’t shirk that responsibility – they go up and take it again. Though the T-Wolves fell short of their desired result, Simonson could find no fault in his team’s effort. “UNBC was two minutes away from a third-place finish in the Pacific, and that’s quite an accomplishment,” he said. “For these boys and how far they’ve come, I’m so proud of them, I really am. THROW-INS: The Cascades honoured a trio of graduating fifth-year players – Skrzeta, Byrne and goalkeeper David Hicks – in a pregame Senior Night ceremony marking their final home games for UFV. . . . Byrne and UNBC fifth-year Conrad Rowlands both wrap up their careers among the Canada West all-time leaders in games played. Rowlands suited up for his 70th game on Saturday, tying the record jointly held by Saskatchewan’s Jerson Barandica-Hamilton and Lethbridge’s Lucas Rajcic. Byrne, meanwhile, played his 69th game – a Cascades record, and tied for fourth all-time in the conference. The Cascades honoured fifth-year seniors Alex Skrzeta, David Hicks and Tammer Byrne in a pregame Senior Night ceremony.